What is another word for downfall? 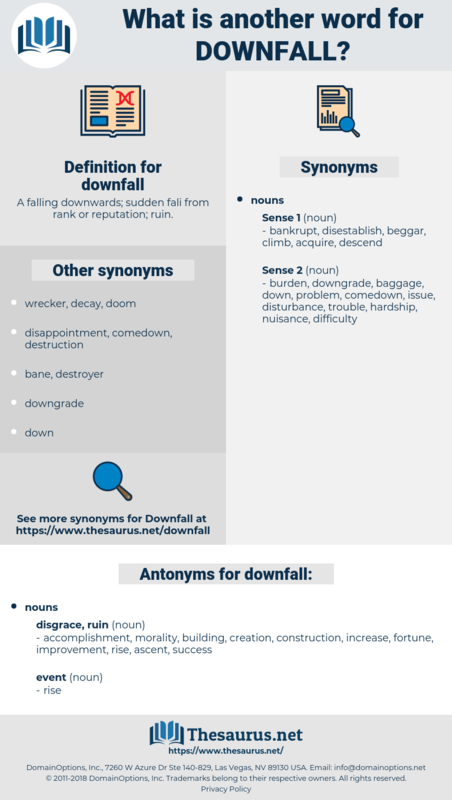 A falling downwards; sudden fali from rank or reputation; ruin. dive, disintegration, downturn, waterfall, deterioration, disappearance, resignation, doom, break-up, bust. 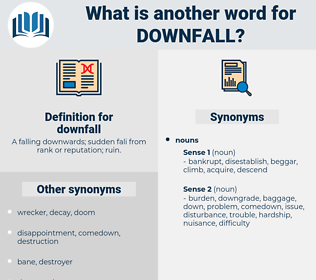 decline, demise, overthrow, undoing, meltdown, ouster, ruination, loss, slump, sinking, ousting, landslide, decrease, collapse, disaster. accomplishment, morality, building, creation, construction, increase, fortune, improvement, rise, ascent, success. gain, renewal, increment, accrual, accretion, flourishing, revitalization, aggrandizement, addition, mizzle, exaltation, flowering, sprinkle, drizzle, advance, supplement, prime, raise, enhancement, upswing, addendum, heyday, headway, augmentation, scud, restoration, up, boost, heightening, mist, blossoming. A sharp wrench jerked him from his feet and he fell heavily, striking his head against the table leg which had previously served for the downfall of the boss. I am sorry for you, because it is obviously painful for a mother to contemplate the downfall of her son. denebola, damnably, damply, dime novel, dumbly, dumbbell, downplay, dimple, deniable. snowfall, hail, virga, sleet, fine spray, snow, rain, rainfall. weather, atmospheric condition, conditions, weather condition. frost mist, frost snow, poudrin, ice crystal, diamond dust, snow mist, ice needle.